How to Cook London Broil? London Broil creates a sense of wonder for my food budget. Often, it’s marked down due to a short dated sale, allowing me to prepare a carnivore’s dream for only a few dollars. The problem? For years, I’d grab it, get it home, and then was stumped with what to do with it. Do you know how to cook London Broil? It creates such confusion for many because London Broil has become synonymous with a cut of meat, yet it’s not. Traditionally, it is a way to cook beef, thereby leaving a lot of home cooks confused as to what to do once they make their purchase, since each time you may have a different cut of beef (thus needing different recipes). The tricky thing about London Broil is determining just what cut of beef you have packaged. If it’s thin, then it’s most likely a flank steak, and in my opinion, always the most difficult to keep moist. No matter how much you marinate it, if you over grill it or over cook it in pan, it becomes tough. If you marinate it overnight, then grill it hot and fast, and do not cook it to more than medium, you have a great option. (As it rests, it will continue cooking). Typically, I use my crock pot for London Broil (that recipe to come), but I knew that I didn’t have enough meat to fill my large crock-pot, nor did I want to heat my oven for hours with for a small pan, so I tried this on the stove with my Dutch Oven. It was out of this world. 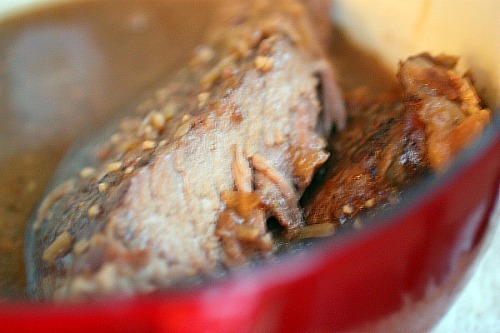 I’ll be adding more London Broil recipes for oven and crock-pot soon. FYI: London Broil is often interchangeable with Flank Steak recipes and this Garlic Flank Steak Recipe is another easy one to add to the repertoire. This was another great recipe for my Pantry/ Freezer Challenge , as I work my way through eating up the things lurking in my freezer and pantry. Summary: This easy London Broil Recipe made on the stove top (or in oven covered), creates a melt in your mouth cut of beef, with a perfect gravy for mashed potatoes. First, heat the oil in a Dutch oven on medium – high and place meat in to brown. Sprinkle soup mix on top, and add onions and garlic. Reduce heat to very low. Cover and simmer for 2 – 3 hours; check occasionally and add a few tablespoons of water, if needed. Honestly, we ended up leaving for a basketball game and it cooked for four hours. Still so moist, but I had the heat on very low and had added a bit more liquid. 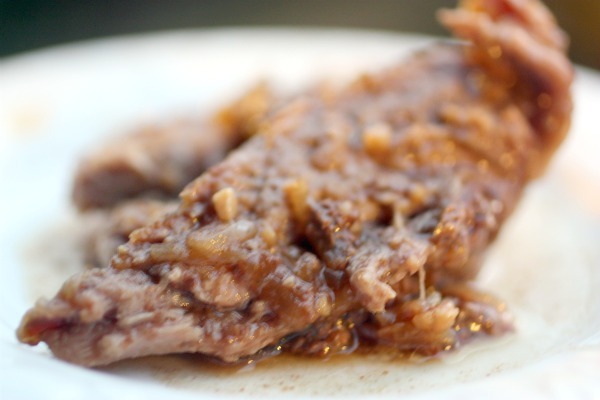 This is a dry heat braise: a much different process than the crock pot. If you add too much water, you will end up stewing the meat, which you do not want, so keep it as dry as possible. Turn over after 1 hour. When meat is fork tender, remove from pot and keep warm, while you whisk the gravy. To make the gravy: Mix flour and water in a cup to form a paste. Add 1 cup water to pan to heat up. Blend in paste, stirring constantly to blend into gravy. I love that some of you are sharing your favorite way to cook London Broil in the comments. Continue doing this and I will add them to my upcoming post. We have London Broil all summer long, and it really satisfies my carnivores’ appetite for meat on my beans and rice budget! I like to throw it in the crockpot with some salt, pepper, and pour some A-1 sauce over the top of it. Underneath goes 4 potatoes cut into hunks. It makes its own wonderful gravy! I also often treat it like a roast. My fave roast recipe? Put it in the crockpot with a can of cream of mushroom soup and 1 can of beef broth. So darned delish. I often make this on a Sunday afternoon, then slice the meat and throw it back into the sauce it made. Eating it one night during the week (after it has sat in its sauce for at least a night) and it gets even more tender and yummy! You can use London Broil to make taco/burrito meat in your crockpot. Toss your meat in the crock, then sprinkle with taco seasoning of your choice and a small jar of salsa. Cook low 8 hours or high for 4 hours. Use 2 forks to shred the meat–so easy to do–it just falls right apart! Spoon it onto flour tortillas and top with lettuce, shredded cheese, sour cream…etc. P.S. You can also do this with chicken and it is equally awesome. Thanks for this awesome idea! We love easy wraps for nights on the go, and this sounds perfect! With all these great recipes we’ll be stocking on London Broil all year round. This recipe was an excellent way to spice up my taco’s. I also made gravy and used it to make roast and gravy sandwiches. I got two meals out of an on sale $5 London Broil. had never cooked London Broil before. Thank you for the wonderful and cost effective meal ideas!!! Will also try this with chicken, then make chicken sandwiches afterwards. YUM! Thank you for clearing this up for me. I can usually buy london broil for cheap but have never figured out how to cook it right. @chris, Who gets on the internet and bashes someone for a recipe? Do you have nothing better to do or is the product of a miserable life? Perhaps both? No one needs to clarify or justify their life with you. I understood the article just fine without needed to berate the author. If one does not like an ingredient then they usually change it to suit their taste and move on. I would seek some form of counseling if I were you. @sevlep, I really think the reply Selves returned in response to Chris, was not only very appropriate, but timely also. So many people have become so holier than Thou and try to give unwanted advise; which, is usually mean-spirited in design. I applaud Selves for pointing this out to all. So the next time I feel like I want to tell someone how to live their life—–I won’t. @chris, Simple solution. Don’t use the recipe. Try another. If you’re scared you’re going to blow up your house or set the neighborhood on fire if you leave an oven on low for a few hours while away, then don’t do that. Tada! So much easier than getting on a post like this just to criticize, don’t you think? I really appreciate this recipe, I have cooked London Broil many times, many ways I will put this recipe near the top of the list. Typically a London Broil is very lean; however, sometimes I’ll find one with a little striation to it, then I like to brown it then steam it with pickling spices, giving a hint of corned beef, only better. Thanks Esther – Unfortunately, I wasn’t the one to add that to yummly, so the person who did would probably need to fix that. Thanks for the heads up. I noticed many comments Are bringing up crock pots… Your recipe was cooked in a dutch oven, right? Omg!!! Came out amazing! Great recipe! Love! I’m a bit confused about the gravy. The recipe only calls for water and flour. This is a white gravy?? With no flavor?? I make mine in a frying pan. Since I ive alone and at times the meat comes from the store in a huge piece I cut it into pieces, each piece is enough for one meal…I freeze the rest. Now here is the thing….I found out if the piece is thicker than 1/2 an inch I fry it at a temp of a wee bit below medium for no more than three minutes. If it is say thicker than 5/8 inch I let go for 3 1/2 to 5 minutes per side. I do not let go to the point it is medium….I like my meat medium rare. If cooked to lonf it gets tough. Here is a tip; when you have the meat on your plate in front of you and are ready to cut it bear in mind the shape of the meat before you initially cut it up. Why? Meat has a grain to it, like a board. If you cut it wrong it will be tough. So seeing as a Cut the original piece into what could be called strips say……3 inches wide across the narrow side of the original piece, then when I am ready to cut the piece on my plate I cut off a slice going the long way. Then cut that piece into bite sized pieces. What that does is giving you a piece of meat that has only a short grain to it. If you were to cut it the other way your bite sized piece would be long grained and much tougher. What would be a good temperature if you did it in the oven? Fabulously!! I did it on top of stove and used Lipton onion soup mix. I had a 2 pound piece of meat and cooked for 2 1/2 bouts. Thank you! I noticed in the recipe list you call for a cup of water to add the the mixture. However in the instructions, you forgot to mention to add the water. It just mentioned the dry ingredients. I made this recipe twice and it has come out perfect. I didn’t turn the meat over, just simmered for 3 to 3 1/2 hours. My family loved how tender the meat was and this is now a favorite of ours. Add extra mushrooms at the end of cooking or while making the gravy.